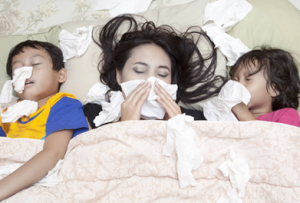 It’s an endless cycle – with every year comes the cold weather and with it comes the flu. One of the most persistent myths about the flu or cold is that you get sick from being out in cold weather. This simply is not true. The only way to get sick is to come in contact with a virus. This all makes perfect sense when you consider that cold weather drives people, and their germs, indoors. Unfortunately, you can’t force others to be conscious about their germs, but you can be conscious about your own. The best way to keep healthy is also the easiest. Always wash your hands with soap and water, and do so frequently. Hand sanitizer itself will not cut it. Hopefully you find joy in cleaning, but if not, maybe the thought of getting the flu will be motivation enough. Cleaning and disinfecting will help you, and those around you, remain healthy. We all have that one coworker or friend who refuses to stay home when they’re sick. While you may not be able to avoid their germs, you can outrun them. According to a recent Flu Study, at least 2 ½ hours of exercise a week can reduce your chances of getting the flu. When you exercise, the components of your immune system are better circulated, which means your immune system has a better chance of finding an illness before it spreads. As another winter approaches and the spirit of togetherness thrives, it is helpful to keep these tips in mind. For a more detailed look at what can be done and what products can help you stay healthy, check out our Flu Prevention flyer.